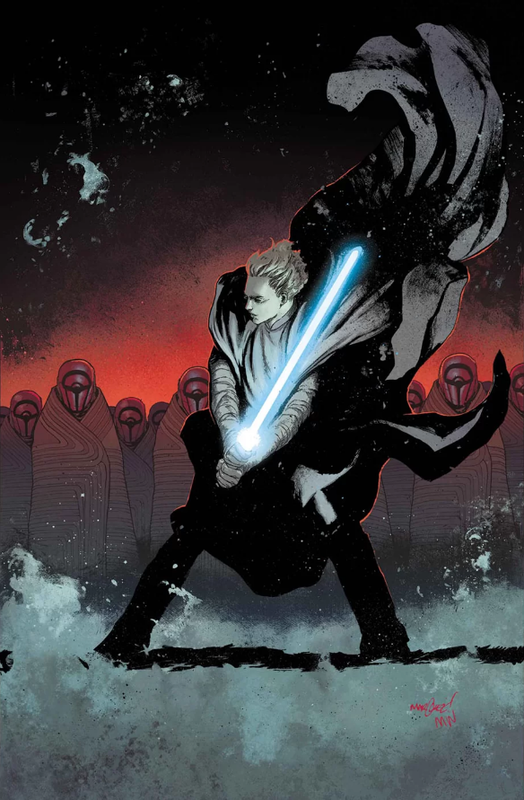 Star Wars #41 gets a little weird and keeps readers in the dark with its mysterious ending, but it’s not a bad issue. From hopeless attacks against the Shu-Torun mining machines, to a dangerous plunge into the abyss, there’s a lot of danger for our heroes. Though there is also a spark of hope. The issue opens with Luke and Chulco seeking out the priests of the Central Isotoper and the ruins of Jedha. The priests are an odd bunch that like to speak in riddles that hint at a direction but don’t provide all the context. Interestingly enough, though, they do appear to have some power and knowledge, and they don’t appear to be straight up dark side users. That said, I’m not sure if I would go so far as to say they’re good people. They urge Luke and Chuclo to look into the abyss to find the answers they seek. Chulco finds madness, and Luke is forced to kill him. In doing so, he learns a lesson – hunting blindly and desperately for answers on the Force is dangerous. Patience is the key. The priests then send Luke on his way and warn him that his friends need help. Elsewhere, Saw’s partisans launch a fruitless attack on the massive mining machine. It fails, and Leia and Han wind up saving the survivors. They’ve got a plan on how to deal with the machine, but they’re waiting on the arrival of a special item. This is where Chewbacca comes in. Unfortunately for him, the Imperial blockage proves troublesome, and it’s only by the intervention of Luke that he’s able to break through and deliver the item to Han and Leia. However, the issue does not reveal what the item is. It’s small, and according to Leia, it could be the answer they need to the giant mining machine problem. The artwork, as usual, has it’s ups and downs with Larroca behind the pen. Some of the panels look great, but the odd artistic style for the faces stands out like a sore thumb when juxtaposed against the style of the rest of the artwork. Sometimes it looks good, sometimes it looks bad, and the end result is a mixed bag. It’s okay, but it isn’t great. The story is interesting, and the cliff hanger certainly leaves you wanting answers. It’s a good hook to keep people reading. And there’s definitely enough interesting ideas in the issue to satisfy readers and make the issue worthwhile. The artwork doesn’t hurt it too much, so overall I give Star Wars #41 a three and a half out of five metal bikinis. I’m not sure I’d call it a satisfying issue, but it’s very interesting.